Hi ladies! I have a quick swatch for you of one of the new Glitter Gal polishes I hauled a little while ago. Kerry and Anna released three new polishes in their 3D Holographic range a little while ago and of course I just had to have them x) A few clicks later and three little beauties were in my hot little hands! Today I have Lizard Belly for you. 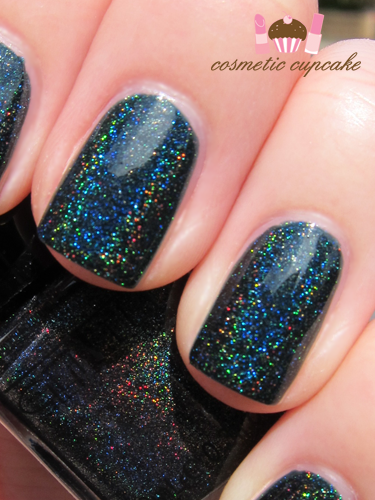 Lizard Belly is a very dark green almost black linear holographic polish. It's so awesome!! I'm going to sound like a broken record but as with other Glitter Gal polishes it's very opaque and it applied flawlessly. I did 2 coats out of habit which is pictured with no topcoat. It dried quickly to a very glossy finish. LOOK AT THAT HOLO GOODNESS!!!!!! It almost looks fake! You can purchase Glitter Gal polishes from the Glitter Gal online store for $11.95. You can see a full list of international stockists here. Oh myyyy this nail polish holo is amazing!!!! I want it! You paint your nails so perfectly by the way! Love it. That is a gorgeous color! I want their polishes. Bad. Lol! Dark blue holo awesomeness. You usually see holos for light shades but not dark. aww you know how much I love your holo posts x)! but the finish just looks flawless, have you used a topcoat? if not = amazing! Gorgeous! Looks like it might be a nice change from my usual black mani. Thanks for sharing! 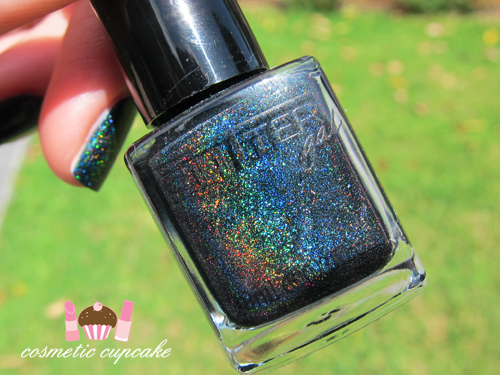 ohh oooh i love the holo soo pretty! Ah, Lizard Belly looks so amazing! Ahhhhh such a gorgeous colour! this glitter gal polish is MAGIC! !